Today developer Pearl Abyss and publisher Kakao Games hosted the Black Desert Online Festa event at the SETEC convention center in Seoul, South Korea. During the keynote presentation, they provided interesting info on the future of the popular MMORPG. We learn that renown score and renown score bonuses will be removed, but DP will be adjusted to make fights longer. Developers also want to complete the new marketplace system as soon as possible. They also want to make life skills more accessible and rewarding for players. 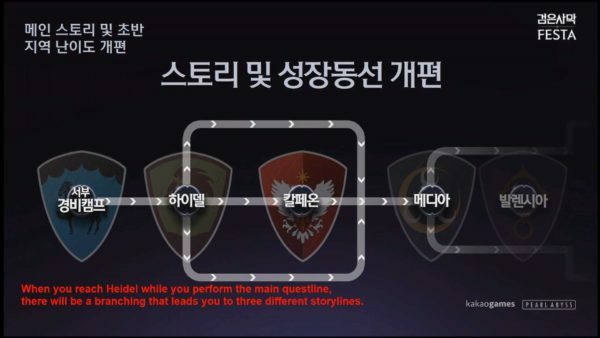 Another interesting change will be done to Black Desert Online’s story quests which have lost focus as development continued and fast progression was considered a priority. This will be radically changed. A new opening cutscene will be and the starting point shifted at the western security camp instead of Olvia. When reaching Heidel, the story will be split into three branches, and the NPCs will meet and our main hunting ground will be slightly different depending on the choices we make. Monsters that previously died too easily will be adjusted to provide more challenge and better rewards. 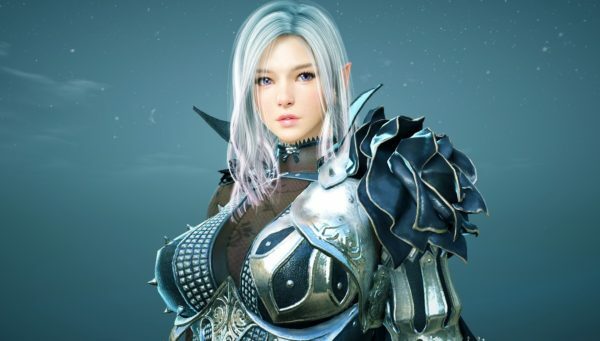 New settings and characters will be added to Black Desert Online, and Ille’zra will finally reveal her appearance. Her emergence will prompt the addition of new stories in Mediah and Valencia. The marketplace system mentioned above is nearly ready to be introduced in the live servers. There is no waiting time and it’s not based on bidding. It’s designed to avoid abuse and randomness, depending on a guaranteed bidding chance. 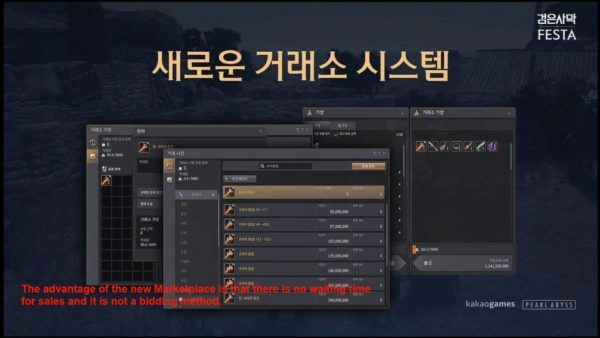 The marketplace currently implemented in Black Desert Online clamps upper and lower prices too conservatively placing sellers in an unfavorable position. The new marketplace will be less restrictive, providing more freedom for the economy. 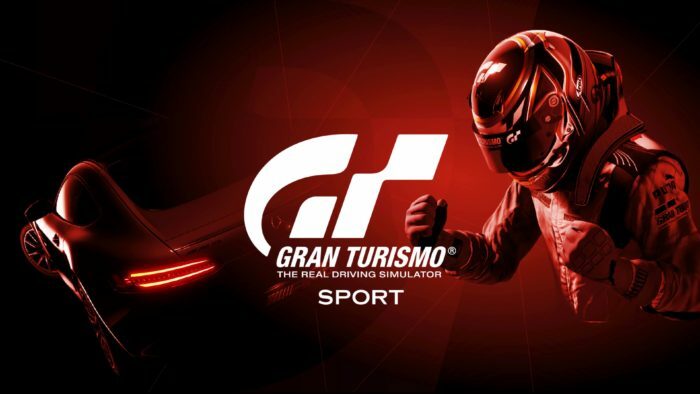 Since it requires new servers to be implemented, there will be some lag between regions for its launch. We also get to see the new O’dyliita region that is in development, and some of its monsters. A conflict between Calpheon and Valencia will begin anew. This will pit guilds who occupy level 3 and 4 bases in Calpheon against their counterparts in Valencia. 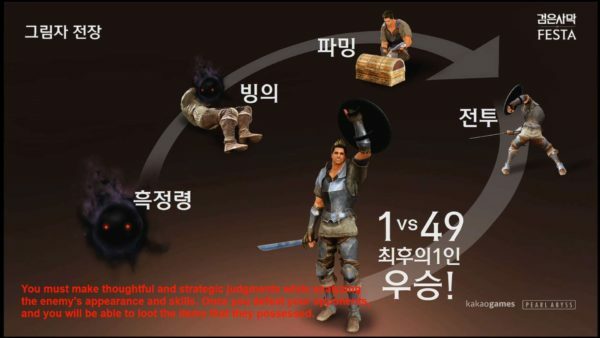 A new mode Shadow Arena will be implemented in Black Desert Online. Basically, it’s a battle royale-like mode with fifty players, where the last man (or woman) standing wins. The participants’ usual level and equipment don’t matter. Everyone starts on the same ground, and when killing an opponent they can loot their items (limited to the items earned within the mode, not their normal equipment). It’s basically fantasy PUBG. 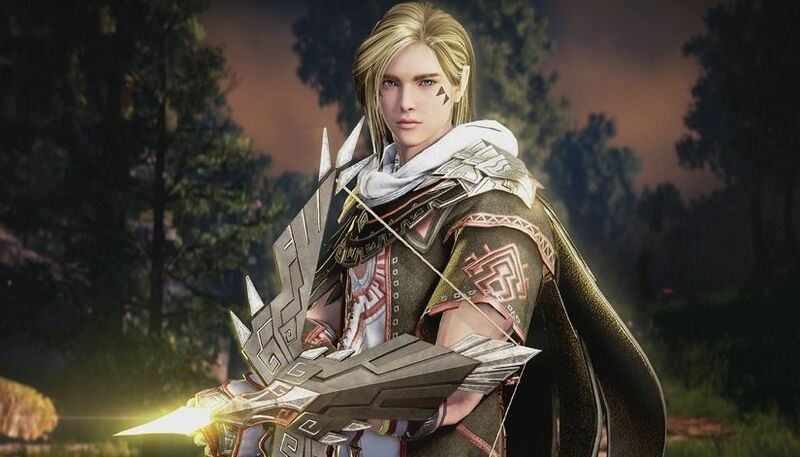 Shadow Arena will be tested in the Black Desert Online Global Lab and the plan is to release it this winter. Pearl Abyss is planning to add better EXP and silver rewards to the Savage Rift and the Red Battlefield, also extending to the Shadow Arena. The goal is to allow players to level up without having to grind. Pearl Abyss want all activities to have meaning so that players can enjoy whatever they choose to engage in. To celebrate the launch of the Archer class, a new event with 100% experience bonus starting on December 12th and continuing for a whole month. On top of that, you can set a character to receive the same experience you get on your archer, up to 99% of level 59. Last, but not least, the “Transaction Butler” costume will be given to all players down the line to reward them for their support. Black Desert Online is currently available for PC, while an Xbox One version coming an just passed its open beta test. 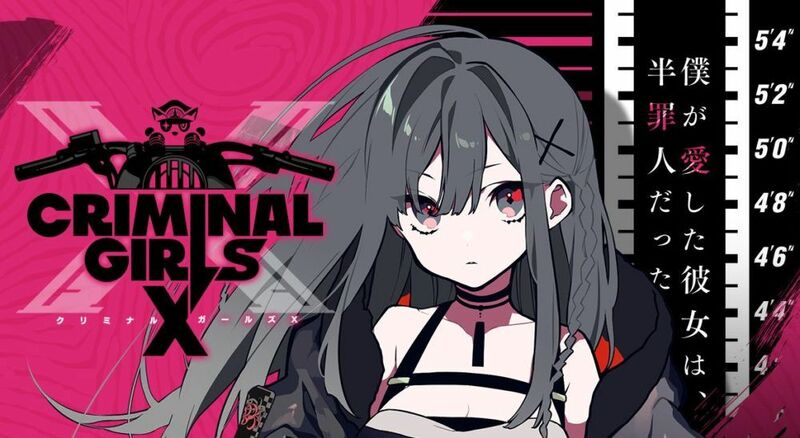 We still don’t know anything about a possible PS4 version, which was teased a long time ago on social media and then simply faded into the shadows, with Pearl Abyss declining to comment when asked.